The application VeryPDF CHM to PDF Converter allows you to convert CHM to PDF and customize PDF page margins. CHM (Microsoft Compiled HTML Help) is a help file format that often comes along with software, which consists of a collection of HTML pages and an index. CHM file are often used to show the usage of software. Sometimes, you may need to convert CHM file to PDF. VeryPDF CHM to PDF Converter is powerful GUI application that can not CHM files to PDF documents, but also can make different settings for the converted PDF documents such as set PDF page margins, page size, page orientation, etc. In addition, it offers Windows version and Mac version for different users. The following steps will take converting a CHM file to PDF on Windows platform as an example to show you how to use this GUI application. At first, please download the installer of VeryPDF CHM to PDF Converter. Then, please double click the installer and follow the setup wizard to install it on the computer. After opening this application, you can see the main interface of this GUI application on the screen. Then, you can add CHM files into the application via one of the following methods. Directly drag the CHM files into the application. Click the Add button on the top of the main interface to open the file picker window and choose CHM files. Please click the Setting button at top of the main interface to open the “Setting” interface in which you can make different settings. 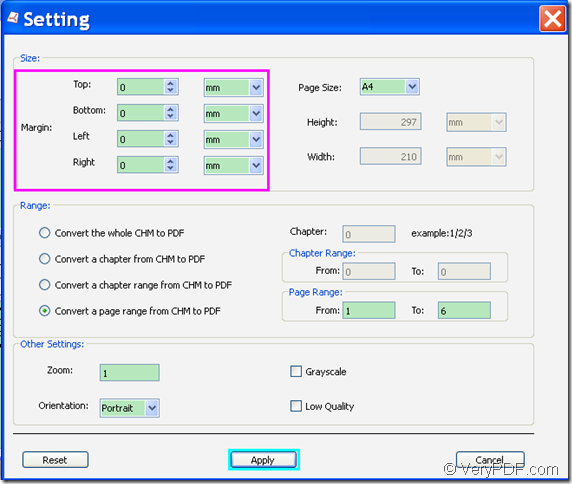 In the opened “Setting” interface, you can set top margin, bottom margin, left margin and right margin for the PDF pages. Please see it in the following snapshot. 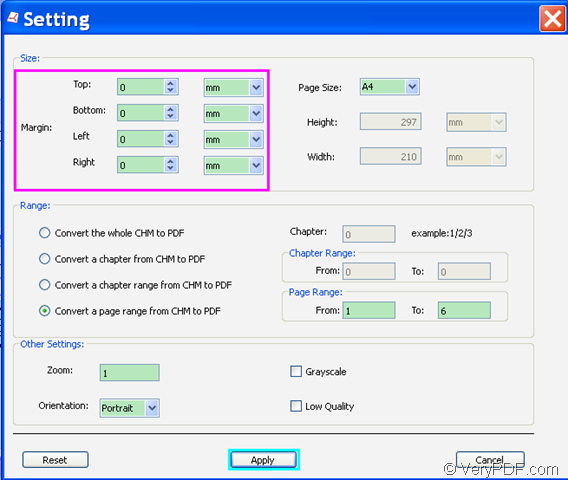 After setting the PDF page margins, please click the Apply button at bottom of the “Setting” interface to apply the settings and go back to the main interface. In “Output Folder:” input box, please input a file path or click the Choose button beside it to choose a folder for the converted PDF document. Then, please click the Start button at top of the main interface to start to convert the CHM file to PDF document. You can check the conversion effect from the following snapshots. 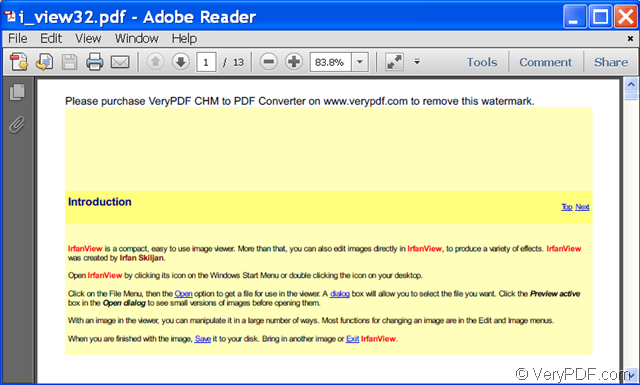 This is the end of this article and you can get full version of VeryPDF CHM to PDF Converter here. 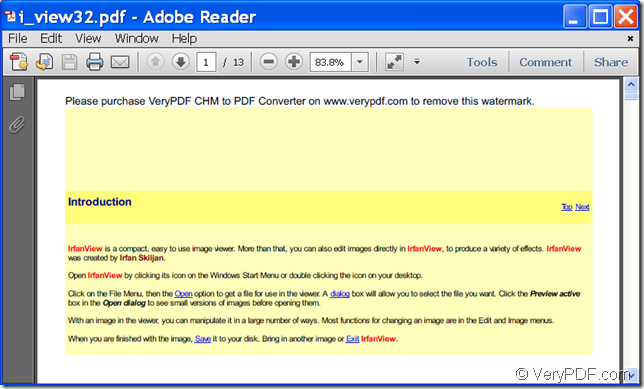 How to convert CHM to PDF under both Mac and Windows?